Military dad wants burglar caught after break in. 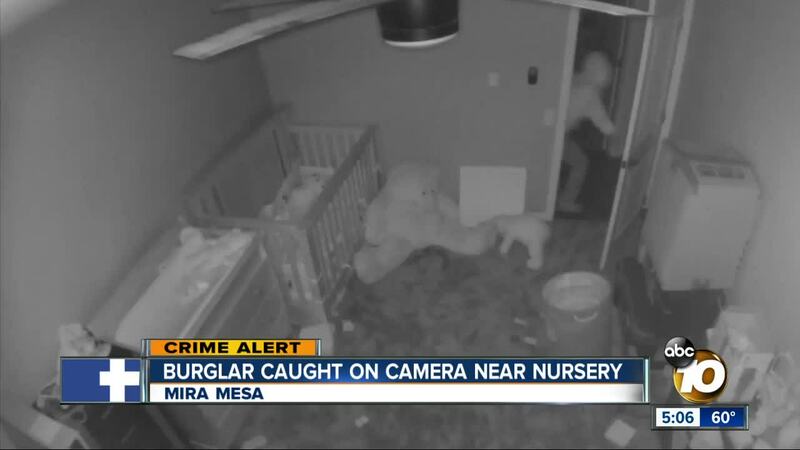 SAN DIEGO (KGTV) - A military family in Mira Mesa is reeling after seeing video of a burglar near their daughter's room while they were out of town. Miramar-based Marine Caleb Ball said he, his wife and their 20-month old daughter were visiting family in Orange County Friday night when they got an alert on their phone just before 8 p.m. The alert was from the video camera in the nursery. "My wife saw that the door was open in one picture and closed in the next, so we looked at it and saw someone closing the door. We hopped in the car and drove down here as fast as we could," Ball said. He was unnerved, "well it was quite upsetting I was just so happy he closed the door, didn't go in there, didn't touch anything, I'm actually very fortunate that happened." He said they were also fortunate the intruder didn't take anything. "The only room it looked like he was in was our bedroom, all the drawers were pulled out." Ball said his safe was also tossed around. They think he was spooked, "we couldn't find anything missing, so whatever he had in his hands, he threw and ran away." The neighborhood, just north of Caminito Jovia and Carroll Canyon Road, is dotted with signs for security systems and neighborhood watch. Several families who spoke with 10News were angry to hear this happened. "Hopefully we have neighbors looking out for each other I know I am, if you see something say something," Angela Cobbler said. She and her husband have a baby as well and she said the idea of someone being so close to the nursery was disturbing. She also said there have been other crimes in the neighborhood, like car break-ins. Cobbler has this message for the intruder, "you know you're going to get caught so, just know that the law will be after you." Ball said next time he hopes he is there to meet the intruder. "We are actually going to add a security system with motion detectors and door latches... So that will blast a large siren if it catches anything." He filed a police report.